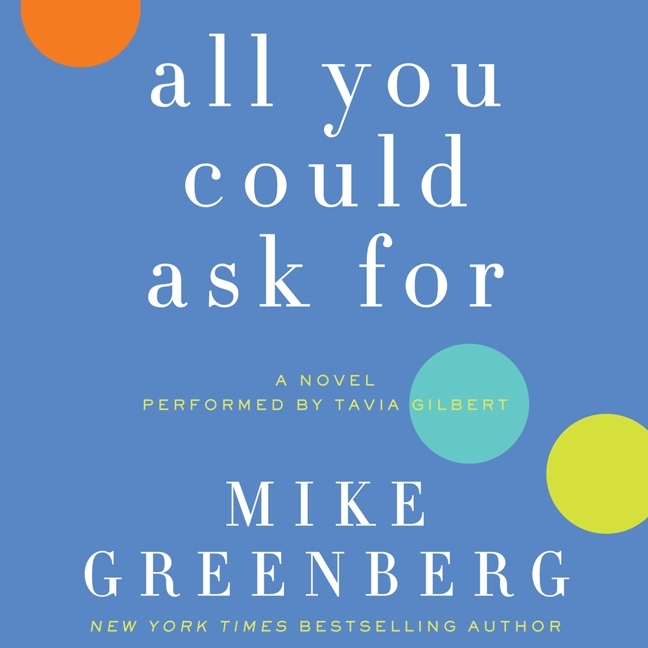 I'm sure you've heard the saying, "Write what you know," but that certainly wasn't the case with Mike Greenberg when he wrote his latest book ALL YOU COULD ASK FOR. For those of you who aren't familiar with the radio show on ESPN called Mike & Mike in the Morning, Mike Greenberg is the co-host of this very popular sports talk with Mike Golic. I happen to really enjoy listening to these two guys talk sport while also occasionally bantering with each other. 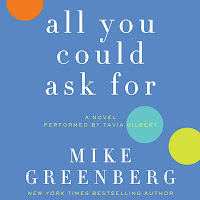 So it wouldn't come as any surprise to me if Mike Greenberg wrote a sports-themed book or even a humorous one (in fact, he's already written two NY Times Bestsellers), but I admit to being a little caught off guard that he wrote ALL YOU COULD ASK FOR, a novel about a special bond between three women! Even more surprising is that he wrote this book in the voices of the three women. Overall, I think he did a decent job. ALL YOU COULD ASK FOR tells the story of three women whose lives are brought together when they are diagnosed with cancer. The first half of the novel sets up the story of each women's life. Brooke is a stay-at-home mom of twins who is devoted to her husband and keeping her marriage fresh. Samantha is a woman who discovers that her husband has pictures of a naked co-worker on his computer... two days after their marriage. And Katherine is a successful business woman whose life is lacking in other ways. She has few friends and is still bitter over the loss of her boyfriend over 15 years ago. The second half of the book begins when the women are diagnosed with different forms of breast cancer. Through an on-line support group, these women develop special friendships and they support each other through some very tough times and tough decisions. I was pleasantly surprised by ALL YOU COULD ASK FOR as well as Mr. Greenberg's writing. I'm not sure I'd go so far as to say that I thought he captured the essence of these women perfectly -- there were a few times when I felt as if what they said (or did) wasn't exactly in keeping with a "typical woman" -- but, for the most part, he did a darn good job. I have to admit, though, that I was probably reading this novel with a more critical eye than I normally would. I seriously doubted that Mr. Greenberg could pull off sounding like a woman... or actually three women! I found the second half of the book, when the story dealt with these women's cancer battles, to be much more enjoyable than the first half of the novel (if "enjoyable" is the proper word.) I thought their actions and even their dialogue seemed to be more realistic, and I especially appreciated how much their friendships developed. I actually began to understand each of these characters (notice I didn't say like!) and I was definitely rooting for all of them to beat the cancer. I have to say that one of the characters Brooke bothered me a great deal. I was very uncomfortable with her decision regarding her treatment and I even got a little mad at how she handled everything. I actually wanted to shake her! I don't want to go into details because it will give away a major part of the novel, but I'm pretty sure I'm not alone with this opinion. In fact, Mike Greenberg's wife even agrees with me. What I found interesting is that Mike Greenberg said in the author interview at the end of the novel that Brooke was actually his favorite character (if he had to pick one.) After listening to his reasoning, I began to respect Brooke's decision even though I'm still not sure I totally agreed with her! What I liked the most about this novel is how it made me feel. I enjoyed that I laughed with these characters while also crying with them. (Needless to say, I wasn't disappointed with the humor in this novel. Mr. Greenberg's personality definitely came through!) I also loved how this book celebrate the strength and resilience of women and their friendships. ALL YOU COULD ASK FOR really was a feel good book despite dealing with a pretty depressing (and scary) issue. ALL YOU COULD ASK FOR would make a great book club discussion. Since the book deals with so many women's issues, it's perfect for discussion. There is a reading guide available with fifteen questions. Some of the themes you might want to explore include career, family, infidelity, secrets, loss, love, illness, health care decisions, parenting, marriage, and of course friendship. You can also discuss whether you think Mr. Greenberg was effective in writing in the voices of three women! I enjoyed ALL YOU COULD ASK FOR. It was a touching story but also one that made me smile more than just a few times! Recommended for fans of women's fiction and chick lit! A final note and one more reason to buy ALL YOU COULD ASK FOR: Mike Greenberg and his wife Stacy created a foundation called Heidi's Angels in honor of one of their best friends who died of breast cancer. The author's profits from the sale of this book will be donated to The V Foundation for Cancer Research to combat breast cancer. What a surprising and gutsy choice of a novel for a sports guy! I wondered if he'd be able to pull this off and it sounds like he did. I hope it raises a lot of money! !